5dimes is based in Costa Rica and is widely considered to be one of the most reliable and trustworthy US-facing sportsbooks. The site has a great reputation when it comes to handing out player rewards and processing payouts in a timely manner. However, there's simply no denying the fact that 5dimes can't match its greatest rivals in terms of experience when it comes to mobile betting solutions. This means that the site's app does have a couple of flaws, which make it somewhat annoying to use despite the excellent functionality that mirrors the desktop PC client. The 5dimes mobile app isn't available for download and is entirely browser-based, which makes it compatible with systems as diverse as Android, iOS, Blackberry and Windows Phone. As you'd expect, the visual design is very simplistic and mirrors the overall design of the desktop version of the site. Nevertheless, the biggest problem with this app is the fact that it simply isn't optimized as well as its competitors, which means that navigating the bets and the act of placing a wager isn't as easy and effortless as it should be. In fact, some bettors are complaining that the app makes it too easy for the user to place a mis-bet. 5dimes is well-known for having an excellent pre-match betting section and covering a wide range of both North American and international sporting events. I'm happy to report that the live in-play betting section adheres to the same standards and is available for mobile users. However, it's worth noting that much like all the other US-facing sports betting sites, 5dimes doesn't offer any live video streaming services. This means that if you want to watch one of the events on your mobile device, you'll have to find a suitable third-party stream. 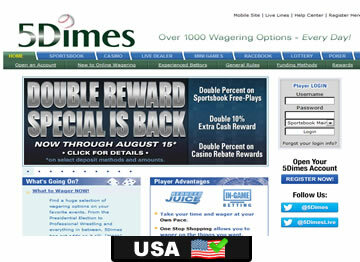 5dimes is a unique sportsbook, so it should come as no surprise that the bonuses offered by this operator aren't exactly standard. 5dimes is the only site that offers a reduced juice promotion, which gives you access to better odds on a wide range of markets. Unlike the standard free bets available with the other sites, this offer has a serious impact on your long-term profitability, which makes 5dimes an excellent choice for active bettors. Generally speaking, no other US-site is able to offer the same bang for your buck, so we recommend claiming this bonus instead of the $520 free play. Like most other US-facing sports betting sites, 5dimes isn't really all that impressive when it comes to the number of available banking options. Deposits are almost always handled using credit card payment, while payouts are almost always settled using a standard wire transfer. Other options include Money Transfers and check. However, what really makes 5dimes worth your attention is the excellent customer service – all deposits and withdrawals are handled without any unnecessary delays, so in most cases your money is essentially guaranteed to reach you in 8 days whenever you decide to cash out, which is pretty impressive if you consider the fact that some of the other US-facing gambling sites take between 2 and 3 weeks.